We hear about random food holidays all the time, but did you know that National Donut Day was actually started by the Salvation Army during WWI?? Celebrated annually on the first Friday of June, this holey-day honors the women who first served the sweet treats to our armed forces. Today, thousands of donut shops sporting the National Donut Day poster will keep the tradition alive and donate a portion of their sales to the Salvation Army. So go on and buy a dozen. Or two. 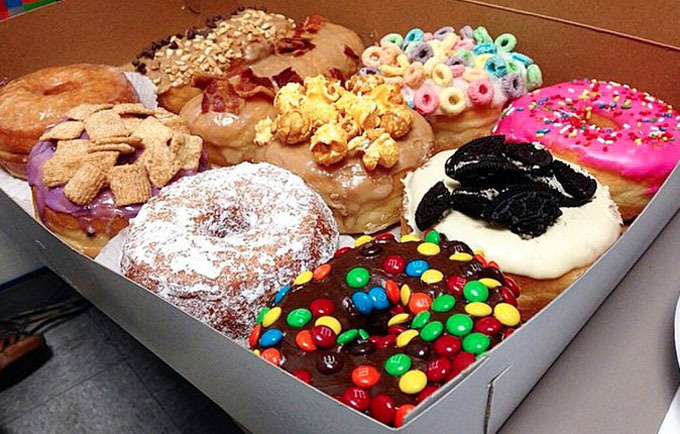 Who says eating donuts is bad for you? Dear Donut Friend, You truly are my mouth’s new BFF and my diet’s worst enemy. Your ridiculously scrumptious and chewy glazed donuts are so good they should be offered at every political summit to unite the world in deliciously sweet peace. And the fact that every morsel, from the White Chocolate Stripes with its subtle tang of tart raspberry to the surprisingly flavorful Husker Blu blueberry cake donut to the endless build-it-yourself options (!!!) just so happen to be vegan … well, clearly you’ve proven that our dear animal friends don’t have to suffer for our raging sweet tooth cravings. And for that, I love you even more. 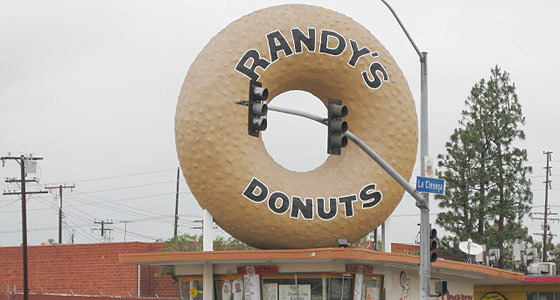 LA’s most iconic donut shop is practically a celebrity itself. Just look at that huge donut-shaped sign. It’s frickin’ awesome. You have to go at least once. Even if it’s just drive-thru. Which is open 24 hours a day! Glazed twists, maple logs, jelly-filled, candy sprinkled, whatever tickles your sweet tooth, it’s all here. And if you find yourself far away with a hankering for Randy’s, just call. They do worldwide delivery. BCB is the country’s first baked donut shop, making it a place where you can indulge with almost no guilt … and no brick-stuck-in-the-stomach feeling. Forget preservatives, artificial ingredients and tons of sugar. This place uses organic ingredients and offers a daily-changing menu of flavors like Earl Gray, Lemon Bean, Banana Man, Rum Raisin, Japanese Sweet Potato and Uji-Kin. Boredom is not an option. 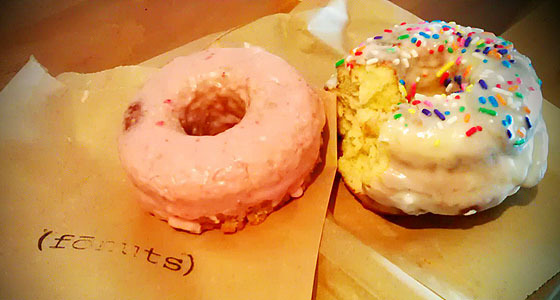 Another donut shop that doesn’t fry, Fonuts offers all of us LA folk a healthier version of the holey treat. That’s because the “faux donuts” are baked and/or steamed, never fried. Back when I wasn’t eating a vegan diet, the cakey and rich strawberry buttermilk was my fave. There are vegan options available every day, but unfortunately none of them are nearly as tasty. Sigh. You’re walking along the Venice Boardwalk when all of a sudden you have an urgent need for the freshest and fluffiest, straight-out-of-the-fryer, made-to-order mini donuts that are generously sprinkled with cinnamon sugar and served in a brown paper bag. And you only want to pay $4 for a dozen. (Or $6 for 30!) Yep. That’s Zelda’s. For the best classic glazed donut it doesn’t get much better than this West 3rd Street spot. There are plenty of other options like the bacon-topped maple and red velvet, but do yourself a favor and get the glazed. Bonus: This place is open 24 hours. Fruity Pebbles donut holes for $1!!!! Need I say more? The cream-filled chocolate donuts at this Little Tokyo spot are so creamy and soft and chewy they practically melt in your mouth. And don’t forget the green tea versions, roti buns and spirulina churros. 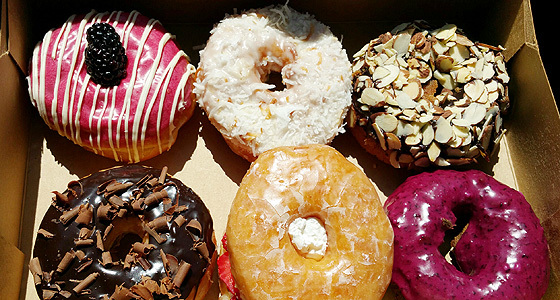 You’d never know judging from its nondescript location in a Santa Monica strip mall, but DK’s Donuts is home to some of the most amaze donuts in LA. The press is sweet on this place, so you’ve probably heard of their Wownuts (LA’s first waffle donuts) and Onuts (insanely big double-deckers). Even the basic chocolate donut is deeelish! They also do a vegan donut, so looks like I’ll have to stop by this place sooner than later. Stan’s the man. We know this. He’s been doing his donut thing since 1965, and there’s a reason people still can’t seem to get enough of him. In fact, there are many reasons. Namely, the Reese’s Peanut Butter Pocket, the pretzel donut, the coconut jelly donuts and the chocolate-covered cinnamon roll. Told you he’s the man. As much as I adore these delicious looking donut picture I would love to try, my general preference for donuts are baked one. I like Fonuts for that reason. If you consider untraditional donuts for this article, I would add RING baked tofu donuts. That’s right! It is made of tofu!! 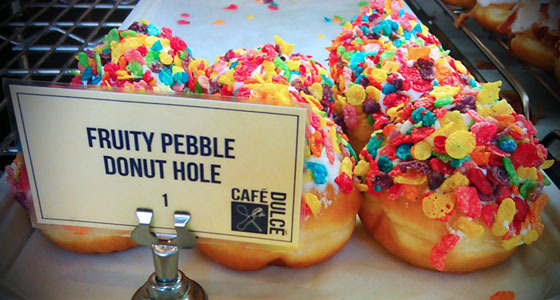 Considering many Angelinos go healthier options, their donut is a good fit for our new life style. Check them out.